I can’t imagine a summer garden without an abundance of peppers. Peppers, both hot and mild, are easy to grow and can be planted through the summer months. There are many varieties of peppers to choose from to suit any palette. Peppers also make great ornamentals and can be grown in patio containers. If you provide your plants with a sunny location and are fairly consistent about your watering (they are forgiving), you’ll end up with plenty of peppers for the eating and the saving until the first hard frost. Depending on where you live, peppers are best started by seed indoors eight to ten weeks or more before the last frost date for your area. Because pepper seeds can be slow to germinate and require warm soil, it’s best to provide bottom heat with seed heat mats, or heat lamp, to raise the soil temperature to 80 F degrees. This will promote quicker germination and more vigorous seedlings. If you don’t want to start your own seeds, simply visit your local garden center to pick up organically grown transplants once they are in season. Select a location in your garden that receives full sun. Full sun means at least six hours of direct sun during the day. If you’ve not already prepped your vegetable garden soil, you’ll want to amend it with compost, composted manure and an organic vegetable fertilizer before you plant. Pepper plants like it hot, so they won’t really take off until the days are warm and sunny. Wait to plant your transplants outside until several weeks after your last chance of frost. 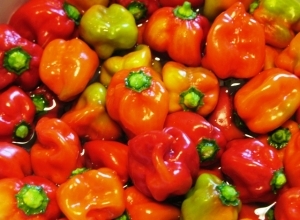 While peppers prefer a moist well-drained soil, they can tolerate some drought once they are well established. Just remember that for the best-tasting and well-formed fruit, you’ll want to keep plants watered consistently. Watering consistently will also help prevent blossom end rot, which results from a deficiency in Calcium uptake in dry soil. Add mulch around the peppers retain moisture and help control weeds. As the pepper fruit begins to develop, you’ll want to shift to an organic fertilizer that is higher in Phosphorus and Potassium. Examples of organic fertilizers high in Phosphorus would be Bat Guano or Bone Meal. Too much Nitrogen at this point will result in more foliage but less fruit. If you provide your peppers with a rich soil full of organic matter, you may not have to fertilizer much to get a bumper crop. If you’re not sure about the quality of your soil, just be sure to add the organic amendments mentioned above and fertilize at planting time and as fruit develops. Once you get the hang of growing peppers, you’ll find you’ll have more than you can eat at any given time and you’ll want to save them for the winter months. 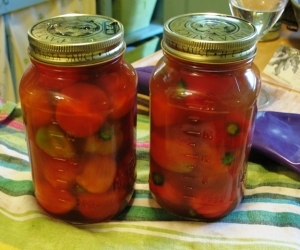 One of my favorite ways to handle all those extra peppers, especially hot peppers, is to pickle them. With some basic canning supplies and a simple recipe, you’ll be able to stock your pantry and enjoy pickled peppers year-round. Pickling is very easy, so if you've never canned anything it's a good place to start. You need glass jars, mason type, with a secure lid, rings, and a simple water bath canner. You’ll need to sterilize your jars and lids before you begin. You can either do this in the dishwasher or boil them for 10 minutes. You don't want your freshly sterilized jars to sit too long before you fill them. They should still be hot. Trim stems off the peppers and make sure to wash them thoroughly. Make a small slice in each pepper to aid in vinegar absorption. It's a good idea to wear rubber gloves when handling hot peppers especially if you're going to be slicing them. The juices from the peppers will soak into your skin and it can be a less than pleasant experience. Also, when you're pickling, you're dealing with hot vinegar, which is an acid. So be sure to wear gloves to protect your hands from burns from both the peppers and the vinegar. It’s also not a bad idea to open a few window in the kitchen if you can! When pickling, I like to use apple cider vinegar because I think it creates a more interesting flavor. In a large pot, bring to a simmer enough vinegar and water (a 50/50 mixture) to fill your jars. Stir in one tsp of pickling salt for each jar you’ll be filling. In each sterilized hot jar, pack in peppers tightly and ad 3 cloves of garlic halved, and 4 to 6 peppercorns. You can also add other seasonings if you’d like. After the vinegar mixture has simmered for several minutes, ladle the hot vinegar into the jars completely covering the peppers. Leave about ½” of space between the liquid and the top of the jar. Run a sterilized knife or spatula between the peppers in the jar to remove air bubbles. Add more vinegar if necessary. Wipe the rim clean with a damp cloth then seal the jar with sterilized rings and lids. Don’t tighten the ring too much, just secure it. Bring water to boil in a water bath canner. Completely submerge the jars into the water bath and process for about 15 minutes. Remove the jars and set them on a dishtowel to cool. You’ll know the lids have sealed when you hear a popping sound and you cannot depress the lid. It should also make a ringing sound when you tap it with a metal spoon. If any lids do not seal completely, either reprocess in the water bath canner or place in the refrigerator. For jars that do properly seal, store them in a cool dark place for a couple of weeks before consuming. Be sure to refrigerate them once you’ve opened the jar. Enjoy!